Yonge Street (/jʌŋ/; "young") is a major arterial route in the Canadian province of Ontario connecting the shores of Lake Ontario in Toronto to Lake Simcoe, a gateway to the Upper Great Lakes. Until 1999, the Guinness Book of World Records repeated the popular misconception it was 1,896 km (1,178 mi) long, and thus the longest street in the world; this was due to a conflation of Yonge Street with the rest of Ontario's Highway 11. Yonge Street (including the Bradford-to-Barrie extension) is actually 56 kilometres (35 mi) long. The construction of Yonge Street is designated an Event of National Historic Significance in Canada. Yonge Street was fundamental in the original planning and settlement of western Upper Canada in the 1790s, forming the basis of the concession roads in Ontario today. Once the southernmost leg of Highway 11, linking the capital with northern Ontario, Yonge Street has been referred to as "Main Street Ontario". Today, no section of Yonge Street is a provincial highway. The street was named by Ontario's first colonial administrator, John Graves Simcoe, for his friend Sir George Yonge, an expert on ancient Roman roads. Yonge Street is a commercial main thoroughfare rather than a ceremonial one, with landmarks such as the Eaton Centre, Yonge-Dundas Square and the Hockey Hall of Fame along its length—and lends its name to the Downtown Yonge shopping and entertainment district. In Toronto and York Region, Yonge Street is the north-south baseline from which street numbering is reckoned east and west. The eastern branch of Line 1 Yonge–University serves nearly the entire length of the street in Toronto and acts as the spine of the Toronto subway system, linking to suburban commuter systems such as the Viva Blue BRT. See the 'Public Transit' section below. Yonge Street originates on the northern shore of Toronto Bay at Queens Quay as a four-lane arterial road (speed limit 40 km/h) proceeding north by north-west. Toronto's Harbourfront is built on landfill extended into the bay, with the former industrial area now converted from port, rail and industrial uses to a dense residential high-rise community. The street passes under the elevated Gardiner Expressway and the congested rail lines of the Toronto viaduct on their approach to Union Station. The road rises slightly near Front Street, marking the pre-landfill shoreline. Here, at the southern edge of the central business district, is the Dominion Public Building, the Sony Centre for the Performing Arts and the Hockey Hall of Fame, the latter housed in an imposing former Bank of Montreal office, once Canada's largest bank branch. Beyond Front Street the road passes through the east side of the Financial District, within sight of many of Canada's tallest buildings, fronting an entrance to the Allen Lambert Galleria. Between Front Street and Queen Street, Yonge Street is bounded by historic and commercial buildings, many serving the large weekday workforce concentrated here. Yonge Street's entire west side, from Queen Street to Dundas Street, is occupied by the Eaton Centre, an indoor mall featuring shops along its Yonge Street frontage and a Nordstrom anchor store at the corner of Dundas Street. The east side has two historic performance venues, the Ed Mirvish Theatre (formerly the Canon Theatre and before that, the Pantages) and the Elgin and Winter Garden Theatres. In addition, Massey Hall is just to the east on Shuter Street. Opposite the Eaton Centre lies Yonge-Dundas Square. The area now comprising the square was cleared of several small commercial buildings and redeveloped in the late 1990s and early 2000s, with large video screens, retail shopping arcades, fountains and seating in a bid to become "Toronto's Times Square". It is used for numerous public events. Another stretch of busy retail lines both sides of Yonge Street north of Dundas Street, including Sam the Record Man until its closure on June 30, 2007. The density of businesses diminishes north of Gerrard Street; residential towers flank this section. The Art Deco College Park building, a former shopping complex of the T. Eaton Company, occupies most of the west side of Yonge Street from Gerrard Street north to College Street. It was converted into a residential and commercial complex after the building of the Eaton Centre. From College Street north to Bloor Street, Yonge Street serves smaller street-level retail, mostly in two- to three-storey buildings of a hundred years' vintage. The businesses here, unlike the large chains which dominate south of Gerrard Street, are mostly small independent shops and serve a dense residential community on either side of Yonge Street with amenities such as convenience stores. The intersection of Yonge and Bloor Streets is a major crossroads of Toronto, informally considered the northern edge of the downtown core. Subway Line 2 Bloor–Danforth intersects the Yonge line here, with the resulting transfers between lines making Bloor-Yonge Station the busiest in the city. The Hudson's Bay Centre and Two Bloor West office towers dominate the corner, visible both from downtown and beyond, with the south-east corner earmarked for a major condominium development. The Mink Mile's borders extend from Yonge to Avenue Road along Bloor. The intersection of Yonge and Bloor Streets is itself a "scramble"-type intersection allowing pedestrians to cross from any corner to any other corner. Immediately north of Bloor, the street is part of the old town of Yorkville, today a major shopping district extending west of Yonge Street along Cumberland and Bloor Streets. North of Yorkville, densities and traffic decrease somewhat and the speed limit increases slightly (to 50 km/h, which it remains for most of its urban length) as Yonge Street forms the main street of Summerhill, which together with Rosedale to the east is noted for its opulent residences. The area is marked by the historic North Toronto railway station, formerly served by the Canadian Pacific Railway. The CPR route parallels the foot of the Iroquois shoreline escarpment, which Yonge Street ascends here toward Midtown. From approximately St. Clair Avenue to Yonge Boulevard, Yonge Street is central to the former suburb of North Toronto and features mixed low-scale residential, retail and commercial buildings. Major intersections in Midtown, served by some of the city's busiest TTC stations, dot the skyline with dense clusters of high-rises in an otherwise leafy residential setting. The intersection at Eglinton Avenue has become a focal point, serving as a high-density residential, commercial and transit hub. The site of Montgomery's Tavern is nearby, scene of a significant clash in the Upper Canada Rebellion and a National Historic Site. North of Yonge Boulevard, Yonge Street traverses the deep forested ravine of the West Don Valley at Hoggs Hollow, a formidable obstacle in pioneer days and the site of one of the last of the former toll gates. The lower-density residential community and park-like setting here represent an interlude between North Toronto and the newer high-rise district beyond, towering over the valley. Canada's busiest section of highway (Highway 401) spans the valley via the Hogg's Hollow Bridge (exit 369). Leaving the valley, densities and traffic both significantly increase on entering the downtown core of the former suburban city of North York. The street widens to a six-lane urban arterial road through North York, passing inner-suburb transit hubs at Sheppard and Finch Avenues. From Finch Avenue to Stouffville Road (acquiring the York Regional Road 1 designation north of the Toronto city limits at Steeles Avenue in York Region), Yonge Street is a suburban commercial strip, passing Highway 407 (exit 77) two kilometres north of Steeles. This 16.5 km (10.3 mi) segment is a busy suburban arterial, interrupted by the original town centres of suburban communities such as Thornhill (where the route crosses the East Don Valley in the upper part of its watershed) and Richmond Hill. Continuous urbanization ends just south of Stouffville Road, and the street passes through brief semi-rural exurban stretches between Richmond Hill, Aurora, Newmarket, and Holland Landing, passing a number of kettle lakes and traversing the crest of the Oak Ridges Moraine, thence leaving the Lake Ontario basin. Yonge passes through the core of Aurora, and in the regional seat of Newmarket, Yonge serves as the town's main suburban artery, passing through low-density residential and commercial areas, bypassing its core to the west. North of Green Lane, Regional Road 1 deviates from the original baseline 56 km (35 mi) north of Lake Ontario, bypassing the centre of Holland Landing with a northwest heading and thereby circumnavigating Cook's Bay and the lower Holland Marsh, through exurban areas en route to Bradford. The bypass was constructed in 1959. Regional Road 51, is the original route of the main section. Yonge Street branches off Regional Road 1 at the foot of the bypass to continue north through Holland Landing. This short section, known locally as the Yonge Street Extension, is co-signed with Regional Road 13. Past Queensville Side Road, the road breaks. The road resumes again for 2 kilometres (1.2 mi) before it for 2.2 kilometres (1.4 mi). After that it begins for another 2.1 kilometres (1.3 mi) before it ends in the upper Holland Marsh. To the west of Holland Landing the main route crosses the Holland River and its polders in the town of Bradford, where the name changes to Bridge Street and again to Holland Street. Resuming its northward heading with a right turn at an intersection in the centre of Bradford, where the road briefly becomes Barrie Street before the name Yonge resumes, Yonge Street roughly parallels Lake Simcoe's western shore, finally entering true rural countryside, traversing the rolling hills of southeast Simcoe County, and is signed Simcoe Road 4. The street officially ends in Barrie at a rail spur, where its name changes to Burton Avenue, which itself ends less than a kilometre from Kempenfelt Bay, at a T-intersection with Essa Road. In Toronto, Yonge St. is served by the eastern half of the Line 1 Yonge–University subway, which runs north from Union Station at Front Street to Finch Avenue. There is also a supplementary bus route running along the street, as well as an overnight Blue Night route which operates after the subway closes. In York Region, it is served by Viva Blue, a bus rapid transit route which connects with Finch station at the northern terminus of the subway. The subway is proposed to be extended north to Highway 7 in Richmond Hill, and the construction of dedicated bus lanes called rapidways for the Viva buses is underway as of 2017 from Highway 7 to Major Mackenzie Drive. Viva Blue is also supplemented by two local-service routes. In Holland Landing, there are transit services as well. In Simcoe County, GO Transit runs a bus route along Yonge from Newmarket to Barrie. Barrie Transit operates a circular route with directional branches that serve Yonge for a portion of their respective routes. A Route 99 Yonge South YRT bus. To Mapleview Drive Clockwise branch serves Yonge between Essa Rd. and Mapleview Dr.
To Royal Victoria Hospital Counterclockwise branch serves Yonge between Mapleview Dr. and Essa Rd. With the outbreak of hostilities between France and Great Britain in 1793, part of the War of the First Coalition, the Lieutenant-Governor of Upper Canada (now Ontario), John Graves Simcoe, was concerned about the possibility of the United States entering British North America in support of their French allies. In particular, the location of Newark (now Niagara-on-the-Lake), the first and former capital of Upper Canada, was in danger of being attacked by the Americans from the nearby border. Additionally, US forces could easily sever British access to the upper lakes at Lake St. Clair or the Detroit River, cutting the colony off from the important trading post at Michilimackinac. Simcoe planned to move the capital to a better-protected location and build overland routes to the upper lakes as soon as possible. Simcoe established York, as Toronto was originally called, with its naturally enclosed harbour, as a defensible site for a new capital. To provide communications between the site and the upper lakes, he planned two connected roads, the first running north from York to Lake Simcoe, (then named Lake aux Claies), the second joining Lake Simcoe with Georgian Bay. This would allow overland transport to the upper lakes, bypassing U.S. strongholds. The route from Lake Ontario to Lake Simcoe is still known as Yonge Street, and the second leg to Georgian Bay was long known as the Penetanguishene Road. Before the construction of Yonge Street, a portage route, the Toronto Carrying-Place Trail, had already linked Lakes Ontario and Simcoe. On September 25, 1793, Simcoe and a small party of soldiers and native guides started northward along the trail, establishing the Pine Fort on the western branch of the Holland River, near the modern location of Bradford. Stopping only to rename Lake aux Claies to "Lake Simcoe" in memory of his father, the party continued north to Lake Couchiching, and then down the Severn River to Georgian Bay. Here he selected the site of Penetanguishene as the location for a new naval base and port. On his return, he met with an Ojibway named 'Old Sail' and was shown a new route along another arm of the trail, this one starting on the eastern branch of the Holland River and thereby avoiding the marshes of the western branch (today's Holland Marsh). They left Pine Fort on October 11 and reached York on the 15th. Simcoe selected this eastern route for his new road, moving the southern end from the Rouge River to the western outskirts of the settled area in York, and the northern end to a proposed new town on the Holland River, St. Albans. Bears were known to wander onto Yonge Street in the early days of Toronto. In 1809 Lieutenant Fawcett, of the 100th Regiment, came across a large bear on Yonge Street and cut its head open with his sword. The road was actually called Concession 1 at first with Concessions 2 etc. on either side. For instance Concession 1 Whitchurch Township faces Yonge St. and goes east to Concession 2, which starts at Bayview Ave. Concession 1 King Township faces Yonge St. and goes west to Concession 2, which starts at Bathurst St. There are 10 concessions in York County going east and west from Concession 1, Yonge St. The east side ending at then Ontario County, now Durham Region, and the west side ending at Peel County (now Peel Region). The following spring, Simcoe instructed Deputy Surveyor General Augustus Jones to blaze a small trail marking the route. Simcoe initiated construction of the road by granting land to settlers, who in exchange were required to clear 33 feet of frontage on the road passing their lot. Certain seasons saw the muddy sidewalks of York in deplorable condition, and Yonge Street was renowned as being particularly bad, making it difficult to transport loads along it. The first Toronto resident known to have introduced sidewalks was Jesse Ketchum, who used tanned bark. In the summer of 1794, William Berczy was the first to take up the offer, leading a group of 64 families north-east of Toronto to found the town of German Mills, in modern Markham. By the end of 1794, Berczy's settlers had cleared the route around Thornhill. However, the settlement was hit by a series of setbacks and road construction stalled. Work on the road started again in 1795 when the Queen's Rangers took over. They began their work at Eglinton Avenue and proceeded north, reaching the site of St. Albans on 16 February 1796. Expansion of the trail into a road was a condition of settlement for farmers along the route, who were required to spend 12 days a year to clear the road of logs, subsequently removed by convicted drunks as part of their sentence. The southern end of the road was in use in the first decade of the 19th century, and became passable all the way to the northern end in 1816. The road was extended south from Eglinton to Bloor Street in 1796 by Berczy, who needed a route to his warehouse on the Toronto lakeshore. The area south of Bloor Street proved too swampy for a major road. A path did exist between Queen and Bloor Streets, but was called the "road to Yonge Street", rather than being considered part of the street itself due to its poor condition. Over time the creeks were rerouted and the swamps drained. In 1812 the route was extended from Queen Street to the harbour, and in 1828 the entire southern portion was solidified with gravel. St. Albans never developed as Simcoe had hoped, but the town of Holland Landing eventually grew up on the site, a somewhat more descriptive name. Holland Landing was settled by Quakers who moved into the area after having left the United States in the aftermath of the American Revolution. The settlers were branching out from their initial town of "Upper Yonge Street", which later became Newmarket. The road almost served its original military purpose during the War of 1812, when construction of a new fleet of first-rate ships began on the Lakes, necessitating the shipment of a large anchor from England for use on a frigate under construction on Lake Huron. The war ended while the anchor was still being moved, and now lies just outside Holland Landing in a park named in its honour. In 1824, work began to extend Yonge Street to Kempenfelt Bay near Barrie. A north-western extension was branched off the original Yonge Street in Holland Landing and ran into the new settlement of Bradford before turning north towards Barrie. Work was completed by 1827, making connections with the Penetanguishene Road. The decision was made to withdraw the military garrison in Penetanguishene in 1852. A year later, the Northern Railway of Canada was built along this established route, between Toronto and Kempenfelt Bay and extended to Collingwood by 1855. Settlement along the Penetanguishene Road pre-dated the road itself. Subsequent extensions of Yonge Street (though never named as such) which later became the more northerly parts of Highway 11, built in the 1830s (some with military strategy in mind), pushed settlement northeast along the shores of Lake Simcoe. By 1860 the Muskoka Road penetrated the southern skirts of the Canadian Shield, advancing towards Lake Nipissing. A horse-drawn streetcar line was completed on Yonge Street in Toronto in September 1861 and operated by the Toronto Street Railway. The line went from Scollard Street to King Street. Streetcar service would be electrified in Toronto by 1892. Confederation and the construction of the Canadian Pacific Railway further diminished the importance of Yonge Street, as the new Dominion of Canada heralded the construction of east-west trade routes spanning the continent. By the 1870s, Dr. Scadding, historian of Toronto of Old, declared that Penetanguishene did not have the importance to need an approach such as the "extension of the Yonge Street Road". During the late 1800s, the Toronto and York Radial Railway used the Yonge Street right-of-way, originally to the town of North Toronto, but expanding over the years all the way to Sutton, on southern Lake Simcoe. The Radial Railway ran along the eastern side of the street, allowing the prevailing westerly winds to remove snow from the slightly raised rails. The arrival of the Canadian Northern Railway in 1906 lessened traffic on the Radial, but it was not until Yonge became a major route for automobiles that the Radial truly fell into disuse. The last TYRR train north from Toronto ran on March 16, 1930. The line was then purchased by the townships north of the city and re-incorporated as North Yonge Railways, running service for another eighteen years before operations ended, along with service on numerous other portions of the Radial lines, in 1948. The space it formerly occupied was used to expand the road between Aurora and Newmarket. Yonge Street was formerly a part of Highway 11, which led to claims that Yonge Street was the longest street in the world. Running (mostly) concurrent with Yonge as far north as Barrie, then continuing beyond through central and northern Ontario to the Ontario-Minnesota border at Rainy River, the highway was over 1,896 kilometres (1,178 mi) long. But Yonge Street could only be called the longest street in the world if were fully synonymous with Highway 11, which has never been the case. The original Yonge Street continues along its original alignment, ending in Holland Landing. This alignment was extended over the years, and today ends just south of Lake Simcoe. The original extension running from Holland Landing to Bradford was named for the towns, known as Bradford Street in Holland Landing, and Holland Landing Road in Bradford. The latter was later extended as a bypass was added, curving off the original alignment. A second bypass was later constructed, bypassing the entirety of Holland Landing Road and joining Bradford at Bridge Street. Likewise, the road between Bradford and Barrie is known as Barrie Street in Bradford and Bradford Street (along with Yonge St.) in Barrie, although Bradford St. is a physically distinct street today. The entire route of Highway 11 has incorrectly become synonymous with Yonge Street. No segment of the highway anywhere north of Barrie ever actually bore the name. However, the Guinness Book of World Records recognized this claim as late as 1999. Provincial downloading separated Yonge Street from Highway 11 during the 1990s. 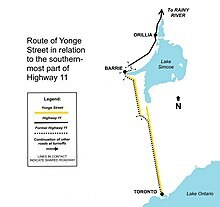 As a result, Highway 11 does not start until Crown Hill just outside Barrie, several kilometres north of where the name "Yonge Street" ends. The Guinness Book of World Records no longer lists Yonge Street as the longest street in the world and has not chosen a replacement street, but cites the Pan-American Highway as the world's longest "motorable road". Although current tourist campaigns do not make much of Yonge Street's length, its status as an urban myth was bolstered by an art installation at the foot of Yonge Street and a map of its purported length laid out into the sidewalk in bronze at the southwest corner of Yonge and Dundas Streets. However, possibly due to wider recognition of the street's actual length, the map inlay has now been removed. On April 23, 2018, the driver of a rented Ryder van intentionally struck numerous pedestrians, killing 10 and injuring 16 others on Yonge Street between Finch and Sheppard Avenues. Yonge is Toronto's main street, hosting parades, street performances and demonstrations. Gatherings occurred during the Winter Olympics in 2002 and 2010, when the Canadian men's hockey team defeated the United States for the gold medal. During lesser celebrations motorists drive up and down the street honking their horns and flying flags. Sections of the street are often closed for other events, such as an annual street festival. In 1999 Ricky Martin held an autograph session at Sunrise Records and had a large section of Yonge Street closed for the day. The intersection of Yonge and Dundas Streets, centred on the plaza at Yonge-Dundas Square, has been closed on occasion to host free concerts, including performances by R.E.M. on 17 May 2001, by Beyoncé on 15 September 2006 and by John Mayer on 16 September of the same year. In 2008, Toronto's first pedestrian scramble was opened at the intersection of Yonge and Dundas Streets. Five-pin bowling was invented and first played at the Toronto Bowling Club at Yonge and Temperance Streets. Ken Westerfield and Jim Kenner are credited with introducing ultimate and other disc sports (Frisbee) to Canada. They did nightly Frisbee shows on the Yonge Street Mall between Gerrard and Dundas 1971-1974. Toronto's annual LGBTQ Pride, Orange Order, and Santa Claus parades also use Yonge Street for a significant portion of their routes. The early works of Canadian singer-songwriters such as Joni Mitchell and Gordon Lightfoot were featured at the Yonge Street location of Sam the Record Man, just north of Dundas Street, at a time when records by Canadian musicians were not widely available. Lightfoot has a song about Yonge Street, titled "On Yonge Street", on his album A Painter Passing Through. Yonge Street was also the subject or setting for an SCTV comedy sketch featuring John Candy. The sketch, Garth & Gord & Fiona & Alice, was a parody of the Canadian film Goin' Down the Road, about young men from the provinces discovering the bright lights of Yonge Street. The Canadian singer-songwriter Bruce Cockburn makes this reference in his song "Coldest Night of the Year," from his album Inner City Front: "I took in Yonge Street at a glance / Heard the punkers playing / Watched the bikers dance / Everybody wishing they could go to the south of France / And you're not here / On the coldest night of the year." Singer and rapper K-os also references the street in the lyrics to his 2004 single "Crabbuckit": "Walking down Yonge Street on a Friday / Can't follow them, gotta do it my way / No fast lane, still on a highway". A Yonge/Downtown pylon on Yonge Street. The northwest corner of the intersection of Yonge Street and Dundas Street in Toronto, Ontario, Canada. ^ the Historical Committee (1984). "Main Street, Ontario". From Footpaths to Freeways. Ontario Ministry of Transportation and Communications. p. 23. ISBN 0-7743-9388-2. ^ Google (March 21, 2018). "Yonge Street route Simcoe County & Barrie" (Map). Google Maps. Google. Retrieved March 21, 2018. ^ Young, Mark C. (1999). Guinness Book of World Records. Bantam. ISBN 0-553-58075-2. Retrieved February 16, 2010. ^ "98/99 Yonge" (PDF). Route Navigator. York Region Transit. Retrieved April 6, 2017. ^ "52 Holland Landing" (PDF). Route Navigator. York Region Transit. Retrieved April 6, 2017. ^ "Barrie corridor" (PDF). Maps. GO Transit. Retrieved April 6, 2017. ^ "Route 8 map (both branches)" (PDF). Maps. Barrie Transit. Retrieved April 6, 2017. ^ Peppiatt, Liam. "Chapter 19: A Sketch of the Grange". Robertson's Landmarks of Toronto Revisited. ^ Peppiatt, Liam. "Chapter 16: The Children's Friend". Robertson's Landmarks of Toronto Revisited. ^ Filey, Mike (2001). A Toronto Album: Glimpses of the City that Was. Toronto: Anthony Hawke (The Dundurn Group). p. 9. Retrieved 2011-01-05. ^ "Toronto History FAQs". City of Toronto Archives. Retrieved 2011-01-05. ^ Austen, Ian; Stack, Liam (April 23, 2018). "Toronto Van Plows Along Sidewalk, Killing 10 in 'Pure Carnage'". The New York Times. Retrieved April 23, 2018. ^ Ricky Martin mania shuts down T.O. ^ "History of the TUC". Retrieved June 11, 2015. ^ "Ken Westerfield Frisbee Pioneer". Retrieved June 11, 2015. Berchem, F. R. (1977). The Yonge Street Story (1793–1860). Toronto, ON: Natural Heritage Books. Magel, Ralph (1998). 200 years Yonge; a history. Toronto, ON: Natural Heritage Books. (b) Baby collection, University of Montreal. Salso Berczy Papers National Archive. Wikimedia Commons has media related to Yonge Street, Toronto. Wikimedia Commons has media related to Yonge Street, York Region. Wikivoyage has a travel guide for Yonge Street.